Most of the major names in set-top boxes have been busy upgrading their devices this year, and that means you might well be in need of a refresher in terms of which 4K streamer is going to be the best buy for you. Here’s our (relatively) brief, point-by-point guide to the top devices on the market, and how you can tell the differences between them. For the sake of brevity we’re not going to give you an exhaustive list of every single app you can run on these devices—assume that you can get Netflix, Hulu, YouTube, Plex, HBO, Showtime and all the other common video-playing apps up on these devices unless we tell you otherwise. Instead, we’ll focus on a handful of key differences in the software and app selections for each gadget. We’re also going to stick to the top-end device in each line (Fire TV, Roku), with a brief mention of the others. More than ever before, your choice of set-top box is less about the box itself and more about the other kit you use, and the ecosystem you’ve already invested in, and the digital assistants you’ve already made friends with. Features and functions are now broadly comparable, with a few caveats, so you need to look at the bigger picture too. Key hardware features: It supports 4K and HDR playback, as well as the immersive Dolby Atmos audio standard. You can control it with Apple’s Siri, use it to manage devices compatible with Apple’s HomeKit, and beam content to it via Apple’s AirPlay. Key software features: If you want to get iTunes movies and shows up on the big screen with a set-top box, this is the only smart box that can do it (unless you use the Movies Anywhere workaround)—and that means it’s the only box to cover everything from Apple, Google, Amazon, and the rest. It works seamlessly with other Apple products and services like Apple Music, unlike every other streaming device. It offers the best specs in a device like this by a long way (the Nvidia Shield excepted)—that means faster, smoother operation for menus, apps, and 4K playback based on the time we’ve spent with it, as well as more potential for apps and games, even if developers haven’t really embraced Apple’s vision: Minecraft for Apple TV recently got shelved and no one really noticed, and there’s no Spotify app. The TV app makes some attempt to unify your watching and searching across multiple services and multiple devices (start watching on an iPad, finish watching on the Apple TV)—it includes the likes of HBO Now, Amazon Prime Video, and Hulu, but Netflix and YouTube are missing (you have to use those apps separately). Why you might buy it: Your entire movie collection is on iTunes, or you use a lot of other Apple devices and want to complete the set. It’s perfect for screen mirroring from iOS or macOS, and everything you can do through that (presentations, photos). In terms of the quality of the audio and video you can get up on screen—60fps 4K, 7.1 surround sound—it’s also one of the best. Key hardware specs: The Chromecast Ultra is no longer the newest Chromecast, but it remains the only one of the family that can play 4K and HDR content. It also has an Ethernet port, if you need it. Key software features: Chromecast isn’t a standalone device, and lacks any real interface or a remote of its own—instead it’s an extension of your phone, tablet, or laptop. That makes it very simple to use and also a little limited: You need another device to get it to work. Cool stuff the Chromecast can do, besides the obvious video and music streaming: Cast your laptop’s entire display (via Chrome) or mirror an Android device screen, branch out into presentations and photos, allow easy guest access for visitors, and work with your Google Home (“hey Google, play Netflix on my TV”). It’s supremely versatile. The big gaps as far as apps go are Amazon Prime Video and anything made by Apple (so no iTunes movies and no Apple Music). You don’t get any kind of universal search across apps either, as it’s just running from your phone or laptop. The slideshow screensaver is a nice touch though. Why you might buy it: It’s refreshingly platform-agnostic, without much of an interface of its own: It works with a ton of apps on iOS and Android, and with Chrome on Windows and macOS. It has a lot more strings to its bow than just video streaming (screen and audio casting), and it’s relatively cheap—check out the $35 Chromecast if you can live with 1080p. Key hardware specs: 4K and HDR support, Dolby Atmos Audio, bundled JBL headphones, Ethernet port, microSD and USB storage expansion. Key software features: Roku devices stand out in not being tied to Apple, Amazon, or Google—they can play content from just about any app or platform out there, except iTunes. Roku also offers plenty of apps you don’t always see on streaming devices: Firefox, weather apps, Twitch, local media players, and more. There’s basic but functional search across multiple apps (and that includes voice search too), the option to plug headphones into the remote (for private night-time listening), and of course that familiar, chunky remote. You can customize your home screens to show your favorite feeds first and even get alerts when particular shows or movies get added. Definitely check out the rest of the Roku line: The $70 Streaming Stick+ and the $40 Roku Premiere will play 4K HDR content, but don’t have all the bells and whistles of the Ultra (like Ethernet, USB, and microSD ports). You get the same choice of channels and high-quality video across the board though. Why you might buy it: You want access to as much content as possible and you don’t mind an occasionally sluggish interface (based on our Roku tests down the years). Roku devices are the most open and the most hackable set-top boxes, so are perfect for those wanting a little more from their streaming device, or those who don’t want to commit to one of the big-name ecosystems. Key hardware specs: Support for 4K and HDR, and Dolby Atmos. There’s 8GB of local storage here, a separate remote, and an Ethernet port for more reliable streaming. Key software features: Alexa! Amazon’s digital assistant is perhaps the most well-integrated as set-top boxes go, and with the Fire TV Cube you can even use voice commands to change inputs on your TV, turn the TV on and off, or adjust volume (though it is rather slow to use). Behind Alexa you’ve got the standard Amazon Fire TV interface, modded from Android: You get all the big names except iTunes video or video from Google (YouTube or Google Play TV & Movies). If you want to watch YouTube, you need to install a browser, and there is a decent selection of non-video apps—news services for example, and even VPNs. Support for Amazon Prime Video and Amazon Prime Music—in terms of browsing content from the top or via Alexa—is, as you would expect, excellent. And if you can live without Alexa, the $50 Fire TV Stick 4K is arguably a better value choice. Why you might buy it: If you want to control your TV and your set-top box with your voice, if you’re a dedicated Amazon Prime subscriber, or if you’re already best pals with Alexa. Otherwise, there are set-top boxes out there with better app selections, better features, and better specs—the Fire TV isn’t quite as universally appealing as, say, the Kindle. Key hardware specs: Support for 4K, HDR, and Dolby Atmos in compatible apps. An Ethernet port and two USB slots (if you need more than the 16GB internal storage). Key software specs: The Nvidia Shield seems to have been lost in the crowd of set-top boxes—or perhaps it’s just priced itself out of the market—but if money is no object, it’s the best choice for Android fans (with full-fat Android TV included) or gaming fans (with Nvidia’s game streaming service and the gamepad accessory, available for a little extra). Android TV offers access to just about every app and service out there, including Amazon Prime Video—though iTunes is of course missing—and now includes some smart Google Assistant integration too. What’s more, it doubles up as a Chromecast, so it can do everything a Chromecast can (see above). All this applies whether you get an Nvidia Shield or buy a television with Android TV on board. The latest interface update makes the whole platform easier to use, in terms of searching for content and picking up where you left off, and it can even act as a Plex server if you need it to. Live TV watching via a USB antenna is another extra you might want to take advantage of. 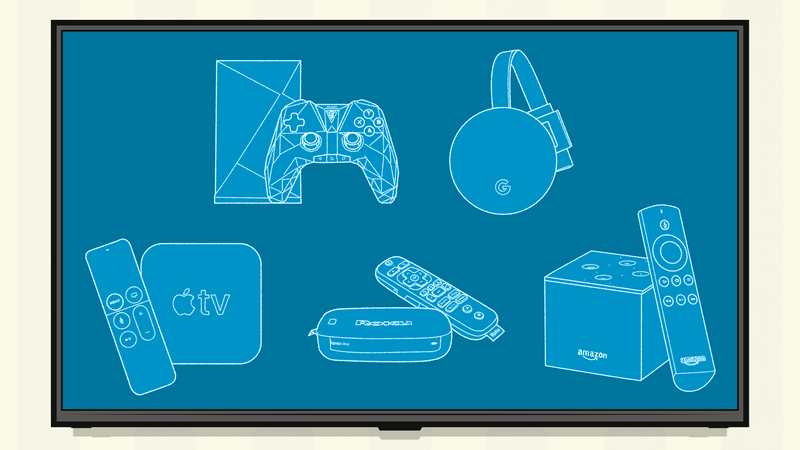 Why you might buy it: Because you want the best set-top box hardware, or because you love the way Android works, or because you’re a keen gamer. If you want to be at the very top end of the set-top box market in terms of specs and features, then this is for you: It’s basically the Apple TV for people who want to do stuff with other non-Apple devices and services.